Now offering 0% Financing. Only $48.71/month! The Janome MC6300P Sewing Machine is for the sewist who wants a superior quality sewing machine without a lot of fluff. The Janome MC6300P Sewing Machine qualifies for our FREE Shipping offer, 0% financing, and a FREE Bonus Kit. Enjoy hassle free shopping and quick order processing when you buy the Janome MC6300P Sewing Machine from us. Call our superb customer service with any Janome MC6300P Sewing Machine questions today. 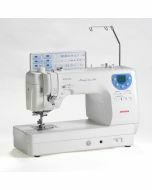 This machine comes with mandatory extras like memorized needle up/down, an independent bobbin winder, and a built in thread cutter, but with fewer decorative stitches and buttonholes than other machines in its class. The Janome MC6300P Sewing Machine has 66 built in stitches and 4 buttonholes that offer the basics necessary for all types of sewing, and 9" of sewing space offers ample room for quilting and other large projects. Janome Factory Warranty Included. Ken's Sewing Center is an authorized Janome Dealer. "Offer valid to US Destinations Only."